When will we get the ibsn so we can preorder? As soon as it’s available for preorder, I’ll let you know. Why do I get the feeling that this will pick up in a war of some kind? I am guessing this will be part 2 in a major story Arc for Merit and Company!!! Can’t wait for more information. Chloe sure has been busy! I wonder if this book has to do with the ‘debt’ Gabe owes to Merit…or if it has to do with the GP. I was wondering are we going to be able to get ‘the story/scoop’ with Damien Garza & Emma (believe it’s correct character)-Tanya’s sister… Will there possibly be a spin off series for the shape-shifters stories???? And thanks for your stories-they make my world a whole lot better!! Keep up the great work, PLEASE! OMGeeeeee the cover is awesome, can’t wait. leather in the rain? that would be so uncomfortable! and squeaky! Is this going to be available as an e book? 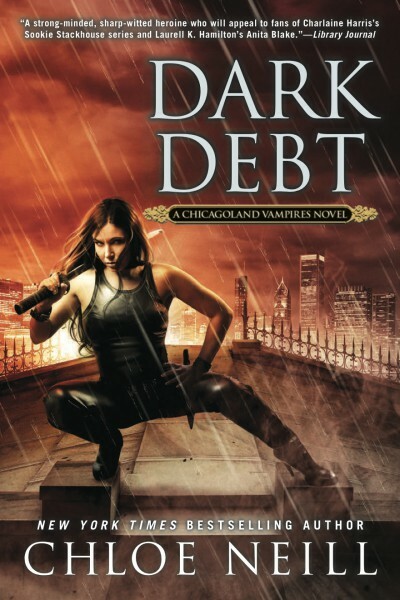 Is Dark Debt the last book or will there be another in the series? No this isn’t the last book… she has 12 and 13 under contract too. She announced that before Blood Games came out. When are we going to get to this one of a kind baby?????? not my favorite cover but still cool. The plot sounds full of mystery and suspense! Can’t wait! Can`t wait for the baby! I want to know the big debt with Gabe. When I had first came across this series I wasn’t sure if I would like it very much. Now I am hooked, I can’t wait for this next book to come out. I know it will be great!!!! When will we be able to get a preview of the book or first chapter like the other books? I have keeping up with this series and i have a feeling that the vampire that made Ethan is going to show his or her face. The only thing is will this be the thing Gabe was talking bout Merit has to go through in order to be able to have a really family with Ethan or is there more to it. one more thing, we have seen Merit been the protector of Chicago and her home. I would love to see how she handles protecting her own kids. one more thing, we have seen Merit be the protector of Chicago and her home. I would love to see how she handles protecting her own kids. I’ve just put a hold on the book at my local library.. They ordered a dozen copies and I am first on the list. I’ve read a lot of paranormal romance series and I just love Chicagoland Vampires. I stumbled across the series by accident and have recommended it to all my paranormal-romance-loving friends. I finished Lucky Break last night and can’t wait for Dark Debt! I think Merit is one of the funniest female main characters I’ve ever read. I often laugh out loud while reading the things she says. Looking forward to the actual marriage proposal and the fated ‘baby’. Can’t wait to find out what Catcher and Mallory were going to reveal, either. I would like to read a spin off series that revolves around one of the other houses. There are some good characters that got left behind. I have been waiting for ages! ‘Dark Debt’ was awesome. I read it in two days and that is amazing beside my english isn’t the best one. Now after finishing the book I would like to know which music you listen during the writing process. I just finished reading this book. All I have to say is that it was AWESOME!!!! Ever time I read the next book in this series I’m never disappointed in what I’m reading. From the moment that I start reading it to the end I can’t seem to put it down. I’m also looking forward to the next book. And I can’t wait until the next one comes out. I do hope that there are more books to come in this series because book 11 left with another cliff-hanger that makes me wanting to know more and if Merit and Ethan are ever going to get their happen ending that they so both deserve. I love this series sooo much, like it has ruined me for other books, Nowadays i find it hard to read other vampire stories because all the heroine r either seem to lack common sense or r just too weak and naive and whiny or r just plain annoying,Merit has set a standard that im not finding easy to beat, But i read somewhere that there will only be 13 books in the series, i really hope that isnt true cause there is still so much of merit to enjoy so if it is true pleeeeaaaseee consider writing a few extras books atleast for those of us that just cannot get enough of Merit,Ethan and the rest of the gang…i for one will read every last one I can get my hands on, So thank u so much for the most amazing and engaging vampire story Ive come across since my twilight days and P.S. these release dates r killing me!!!!! !